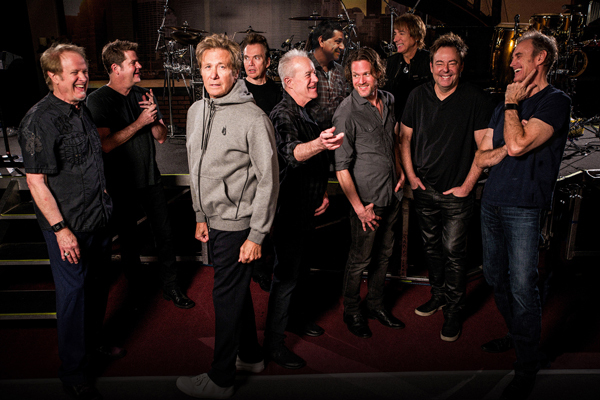 (NEW BRUNSWICK, NJ) -- State Theatre New Jersey presents the Grammy Award®-winning band, Chicago on Monday, April 15, 2019 at 8:00pm. Chicago’s hits include “Hard to Say I’m Sorry,” “You’re the Inspiration,” “25 Or 6 To 4,” and “Make Me Smile.” Tickets range from $55-$150. Hailed as one of the “most important bands in music since the dawn of the rock and roll era” by former President Bill Clinton, the legendary rock and roll band with horns came in at number four, the highest charting American band in the chart’s history, in Billboard Magazine's recent Top Bands and Duos. Chicago’s lifetime achievements include two Grammy Awards®, two American Music Awards, Founding Artists of the John F. Kennedy Center for the Performing Arts, a star on the Hollywood Walk of Fame, a Chicago street dedicated in their honor, and keys to and proclamations from an impressive list of U.S. cities. Record sales top the 100 million mark, and include 21 Top 10 singles, five consecutive Number One albums, 11 Number One singles and five Gold singles. An incredible 25 of their 36 albums have been certified platinum, and the band has a total of 47 gold and platinum awards. From the signature sound of the Chicago horns, their iconic vocalists, and a few dozen of ever-classic songs, this band’s concerts are celebrations. 2019 marks the band’s 52nd consecutive year of touring, without missing a single concert date. The original four band members are Robert Lamm on keyboards and vocals, Lee Loughnane on trumpet and vocals, James Pankow on trombone, and Walt Parazaideron woodwinds. The band line-up also includes Wally Reyes, Jr. on drums, Keith Howland on guitar and vocals, Lou Pardini on keyboards and vocals, Ray Herrmann on sax and flute, Neil Donell on vocals,Brett Simons on bass, and Ramon “Ray” Yslas on percussion. For tickets, more information, or group discounts, call State Theatre Guest Services at 732-246-SHOW (7469), or visit STNJ.org. State Theatre is located at 15 Livingston Ave in New Brunswick, New Jersey.